Do Your Investments Measure Up? 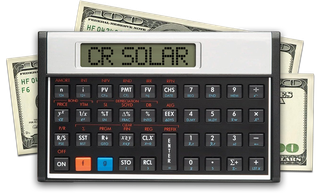 Use this calculator to quickly see that it probably makes better financial sense to invest in a CR Solar energy solution. If investment income is not a factor in your finances, consider using our simpler Solar Energy Savings calculator. Enter the annualized, post-tax rate of return, as a percentage for your income-generating CD, savings or other investment for comparison. A typical, non-compounding annualized rate of return of 3.00% is preselected, but you can adjust the slider to better match your situation. Overall, by the time your CR Solar solution pays for itself, it will have saved you an estimated $ in monthly expenses, whereas your income-generating CDs, savings or other investments would have earned $. Looks like you are either extremely optimistic about future grid electricity prices or have some really great returns on your income-generating investments or both. It may make more sense for you to keep your money in the bank, unless you consider the additional benefits of improving your property’s value or helping to preserve the environment.